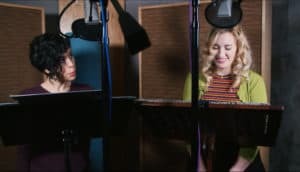 Life is Strange: Before the Storm Bonus Episode Brings Original Voice Actors Back | Nerd Much? Life is Strange: Before the Storm is a prequel to the excellent Life is Strange core series which launched in 2015. The core series features primarily upon the two main characters of Max Caulfield and Chloe Price. The prequel series happened to be developed during the recent video game voice actor’s strike. Due to those circumstances, and the fact the game portrayed a Chloe that was several years younger, the developers at Deck Nine decided to bite the bullet and replace Chloe’s original actress, Ashly Burch. Max Caulfield doesn’t appear in Before the Storm so there was no need to replace Hannah Telle, the actress that portrays Max. The voice actor’s strike has ended though. So Deck Nine and the publishing team at Square Enix have a treat for Life is Strange fans. But only if you’ve purchased the Deluxe Edition, of course. They’ve announced that Farewell will be reintroducing Burch as Chloe and Telle as Max. Some fans argued that Chloe’s change in voice had a jarring affect on them while playing. Others thought that Rhianna DeVries did a fantastic job portraying the younger Price. Regardless, many will welcome the opportunity to experience Ashly Burch getting another crack at the role. Square Enix hasn’t announced when we can expect to get our hands on Farewell. “Early 2018” is the closest they get to specifics. It may be a bit longer than we’re hoping though as we’ve still yet to get a release date for Life is Strange: Before the Storm’s third episode, Hell is Empty. If you’re interested in checking out a clip of Burch and Telle jumping back into their Life is Strange roles, hit play below.